1. Department of medicine, Section of Hematology and Oncology, The Aga Khan University Hospital, Karachi, Pakistan. 2. Department of Radiation Oncology, The Aga Khan University Hospital. BACKGROUND: Febrile neutropenia (FN) and myelosupression remain a challenging oncologic medical emergency and dose limiting toxicity associated with chemotherapy for cancers. Various factors are known to affect the outcomes for patients diagnosed with FN. Electrolyte abnormalities have commonly been observed, but the real incidence and their impact has been only scarcely studied in literature. METHODS: This was a prospective, observational study. A total of two hundred and fifteen (215) patients admitted between January 2007 and August 2008 were included. Analysis of data was made using SPSS version16.0.Toxicity profile was graded according to CTC version 3.0. CONCLUSION: This analysis, which is first of its kind, suggests that decline in electrolyte levels is frequently observed in patients presenting with FN. These abnormalities can have independent negative impact on the outcome for such patients. Special attention should be paid to electrolyte imbalance right from the outset. Febrile neutropenia (FN) and myelosupression remain a challenging oncologic medical emergency, and dose limiting toxicity associated with chemotherapy for cancers . Although availability and choice of antibiotics has progressed over the years, FN and its associated complications remain a major source of morbidity, inpatient stay, cost and mortality . The average cost for management of FN in USA is quoted to be as high as US $15,231 for inpatient therapy and US $7,772; for outpatient management . Mortality rates from febrile neutropenia are reported to range from as low as 5% in an average risk cohort to as high as 82% in high risk patients . Analytical models to predict outcomes and length of in hospital stay (LOS) in FN patients based on presentation, co morbid conditions, biochemical parameters, type of malignancy and disease burden have been proposed and are used in clinical practice [4-6]. Algorithmic approaches to treat FN have been developed based on clinical parameters. Standard approach to treatment included obtaining specimens to identify focus of infection and begin empiric antimicrobial therapy based on local microbiological data, as delay in initiating treatment is associated with worse outcome . Although used frequently, role of colony stimulating factors, in primary and or secondary settings is controversial [2, 8]. Modalities have been identified to risk stratify patients and treat those having logistic reasons by outpatient pre-emptive approach with good outcomes . The degree of neutropenia and severity of infection depends upon dose intensity of the chemotherapy and is therefore different for various chemotherapies . The incidence of FN depends on the type of chemotherapy with rates close to 98% for patients undergoing high dose chemotherapy with hematopoietic stem cell rescue during the pre engraftment neutropenic phase and about 10-20% in patients going standard treatment for cancer such as Non Hodgkin's lymphoma (NHL) . Electrolyte imbalances per se have not been studied with relation to affect on outcomes in FN so far. The incidence and importance of abnormalities in electrolytes like Na, K, Mg and Ca is unknown. Based on our observation that patients reporting as inpatients for management of FN also frequently required intravenous electrolyte replacements, we conducted a prospective study of all patients coming to in patient care for the assessment of their electrolyte abnormalities and its possible association with, clinical presentation, length of stay, response to therapy, association with chemotherapy regimen, type of malignancy and the final outcome. This was a prospective study conducted from January 2007 to August 2008. All patients who were admitted with the diagnosis of chemotherapy induced febrile neutropenia were included. Febrile neutropenia was defined as single temperature of >38.3ºC (101.3ºF), or a sustained temperature >38ºC (100.4ºF) for more than one hour, in a patient with absolute neutrophil count (ANC) of < 500. Electrolyte abnormalities observed on admission were recorded and a Performa was filled in to document all the relevant data. National cancer institute toxicity criteria (NCCI toxicity Scale) version 3.0 was used to grade the electrolyte abnormalities observed. Data was entered into Microsoft Excel Sheet© and final analysis was made by Statistical Package for Social Sciences (SPSS) version 16.1. Chi Square and Fischer's Exact Tests were utilized for analysis of statistical significance of results. A total of 215 patients who were admitted at our hospital with chemotherapy induced febrile neutropenia were included. Almost equal number of males and females were found to be affected with 107 patients being male and 108 female. The mean age was 51.53 years; the average age of males was 49.93 years and average age in females was 52.95 years. Most of the patients presented at the Emergency Department (70%) while the rest presented to the clinic or were referred by outside physicians. Patients had underlying hematological malignancy in 48.8 % of cases while 51.2% had solid organ tumors. The most common underlying malignancy was breast cancer (25.6%), followed by non-Hodgkin's Lymphoma (22.8%) and Acute Myelogenous Leukemia (12.6%). Other notable but less common malignancies seen in our patients were ovarian cancer (7.4%), Acute Lymphocytic Leukemia (5.6%) and Sarcoma (3.3%). Most of the patients (31.6%) presented with febrile neutropenia after they received their first cycle of chemotherapy, with 14% being affected twice, 20% developing it for the third time, 13% for the fourth time, and 7% for the fifth time. Electrolyte abnormality of all grades combined was seen in 83% of patients. Hypokalemia, of any grade, was seen in 48% of patients. Among those 51.4% had grade I, 33.3% had grade III and 15.2% had grade IV hypokalemia. Hyponatremia of all grades was seen in 67.9% patients, 60.3% had Grade I, 33.3% grade III and 0.7% patients had grade IV hyponatremia. Hypomagnesaemia was seen in 54.3% patient, 94.7% having grade I decline. Of all 65% of our patients received intravenous (IV) electrolyte replacement. Gender distribution across the patients demonstrating electrolyte imbalance was found to be similar with 85% males and 83% of the females affected. 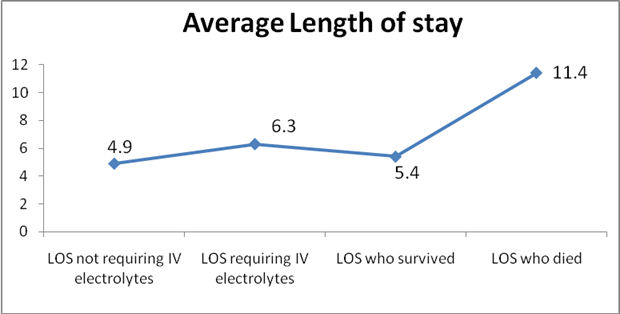 Average length of stay in patients who received IV electrolyte replacement was 6.3 days compared to 4.9 days in those who did not (p < 0.016). In those patients who were successfully discharged the average length of stay was 5.4 days whereas it was 11.4 days in patients who died (p value < 0.0001). Intravenous sodium replacement was given to 66% of patients. Among patients who had hypokalemia, 73% required IV replacement while 58% of patients were also given oral potassium replacement. We observed that 42% patients were admitted to rooms with isolation protocol. Rest of the patients were admitted to the either general ward (19%), or private rooms (38%). Special care unit transfer was required in 90 patients (41.8%) during the course of their stay, of these 75 patients (83.3%) were found to have electrolytes abnormalities most commonly hypokalemia (87%). The mean age in patients who died was 51.05 years; average age of males who expired was 50.46 years and that of females who expired was 52.57 years. Co-existing vomiting, diarrhea or both was seen in 12% of patients with electrolyte deficit. In all 199 patients (92.5%) were successfully discharged after management of FN, 15 patients (6.9%) died. One patient left against medical advice. Electrolyte abnormalities were seen in 86.6% (n=13) of those who died. Hyponatremia of grade III was seen in 56% of 9 patients who died, Grade II hypokalemia was seen in 4 patients who had hypokalemia alone or in combination with hyponatremia. Overall more deaths were reported in patients admitted under isolation (8.9%) than in patients admitted to the general ward (7.3%) or private rooms (3.7%). Patients presenting to the Emergency were more likely to die (8.7%) compared to patients who were referred from elsewhere. We found that there were more deaths in males, as rate of mortality was 26.6% for females and 73.3% for males. Among those who died males demonstrated more electrolyte abnormalities compared to females (90% vs. 75%). Chemotherapy induced FN is a serious oncologic emergency with a potential to have a fatal out-come [11, 12]. There are on average about 200 admissions in a year, to our hospital with a diagnosis of chemotherapy induced febrile neutropenia. Clinical parameters to predict outcomes in FN patients have been studied and various risk stratification guidelines are proposed . In the present era of modern antibiotic therapy, where coverage against most infective organisms is available, factors other than infection itself are becoming increasingly evident as predictors of outcome in FN . Electrolyte abnormalities per se have not been as yet nominated as one of the factors for predicting a worse outcome, indirectly though, mucosal breach associated with cytotoxic chemotherapy has been suspected to be a cause of worse out comes in patients having cytopenia secondary to chemotherapy, compared to those who have neutropenia secondary to viral infections . What exactly causes the electrolyte abnormalities that are observed with FN remains to be elucidated, but results from our study suggest that it seems very unlikely that only vomiting or diarrhea associated with chemotherapy are the cause, as only 12% of our patients were found to have the two co-exist. Similarly most of the patients also had a preserved renal function when depicting electrolyte loss. Analyzed as a single variable, electrolyte abnormalities requiring IV administration resulted in a longer stay by approximately more than one and half days (Figure 3). The fact that most of the patient who died had some degree of electrolyte imbalance, both hypokalemia and hyponatremia, carries weight but is not statistically significant because of a smaller sample size. The need of IV replacement of K+ made shifting of patients to special care rooms with cardiac monitor necessary, the special care transfer and longer stay are a reason for increasing treatment cost . We did not find any difference with regards to gender or type of malignancy (whether solid or hematological) with reference to development of FN and/or electrolyte deficit, but we saw that more male patients who died demonstrated electrolyte imbalance compared to females. The overall mortality attributed to FN in our series was comparable to that seen in international literature. Whereas, we observed almost a similar number of patients suffering from hematological and solid tumors, most of the published literature shows a trend towards more incidence for hematological cancers . We, in contrast, to other studies did not find the increasing age to be more associated with deaths, we assume that the reason is because more elderly patients are given prophylactic G-CSFs now, then before, therefore the number would have been quite less to affect the analysis. The various factors associated with increasing cost, morbidity and mortality continue to be studied, with many being already validated. Our study points out that Electrolyte abnormalities and specially those requiring IV replacement, result in a longer length of stay and cost of treatment. We observe that deficits of Na + and / or K + are also frequently seen in patients dying with FN. Whether routine recommendation of measures that prevent electrolyte deficit such as oral rehydration salts will result in better outcome in patients receiving chemotherapy, require larger prospective studies. Average Length of stay per Iv replacement and outcome.